Whether you are heading overseas for business or leisure, sometimes it’s necessary to have a reliable internet connection wherever you go. However, sticking with your usual provider when travelling internationally can lead to huge bills for coverage that is ultimately unreliable — iNet offers affordable pocket WiFi to keep you online whenever you need it during your travels. By choosing iNet to cover all your mobile data needs, you can enjoy the convenience of an unlimited 3G internet connection* in Canada without breaking the bank. Sending emails, loading maps and reading WhatsApp messages on the road with ease under a steady rental plan that won’t surprise you with any hidden fees. We understand your needs may vary, which is why we offer two different options to meet your requirements and your budget. Our full 3G Vodafone pocket WiFi router offers 15Mbps downloads, 10 hour battery life and can be accessed by three users at once on any device. However, if you only need a connection for your smartphone or tablet, our cheaper T-Mobile device provides you with 5.76Mbps downloads without PC compatibility, and is able to be used by up to five users at any one time. With devices offered for countries all over the world and free delivery service available at all Commercial & Industrial address in Hong Kong, iNet can provide you a convenient, affordable and reliable way to stay connected while you travel. Follow us on WeChat and receive a 5% discount on your next booking! 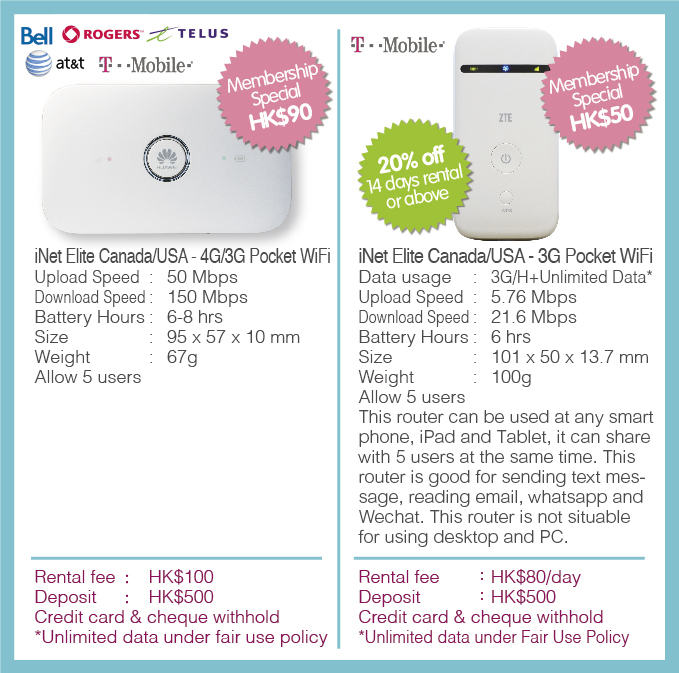 To make an enquiry or organise a booking for a Canada WiFi egg, don’t hesitate to get in touch with us at +852 3502 1188. Alternatively, fill out our booking form or send an email to enquiry@inet-international.com.hk.